Posted on August 23, 2016 June 9, 2018 by NGCHS, INC. In 1945 the national organization of cowboys had become the Rodeo Cowboys Association. That year the Wilbanks family offered to sell the rodeo grounds to the Payson Chamber of Commerce for $2,500. The offer was turned down, and the land became a subdivision called Rodeo Ranch Estates. Desperate for a new location, the rodeo committee moved it to the junction of highways 260 and 87. That land was National Forest property, so private offers to build a grandstand and a year-round racetrack were vetoed. Then in 1958, a plan was put in motion that would take some years to mature. Dale Rumsey secured 20 acres from the Forest Service with the idea of establishing a home for the Payson Rodeo. In 1961 Rumsey sold 10 of the 20 acres to the Chamber of Commerce, and the rodeo was moved to what would one day be called Rumsey Park. It became a community effort. A well was put down by Aaron Haught, grandstands were built with lumber donated by Kaibab Industries, and many others donated time and materials to finish the rodeo’s new home in 1968, time for the 84th annual event. By 1976 the Chamber of Commerce had paid off the debt, and the town of Payson accepted ownership of the rodeo grounds as a gift from the chamber. The town proceeded to negotiate with Mr. Rumsey for the remaining 10 acres. If the entire 20 acres could be consolidated, a grant would be available for the creation of a city park. In return for naming the park after him, Mr. Rumsey donated 3.143 acres to the town, and the town purchased the other 6.857 acres at a fair market value of $7,000 an acre. With the 20 acres in place, the Outdoor Recreation Coordinating Commission gave the town a grant of $383,295.36 to construct the park. By the middle of 1987 the town had invested twice that amount in developing the park. However the development continued, and 9 more acres were secured from the Forest Service on which to build the community swimming pool and place a water storage tank. 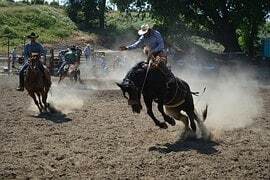 During those years, the local committee affiliated with the Rodeo Cowboys Association, and from then on nationally known contestants came to Payson. Rumsey Park became a spacious place where citizens of all ages could gather for fellowship and play. In 1995, after 27 years of service, the Rumsey Park grandstands were condemned as unsafe and uninsurable, so new stands were built. These (grandstands) were moved in the year 2000 to the next home for the Payson Rodeo, the Payson Event Center south of town.